Acoustic enclosures to a `Primary Plasma Cutting Machine’ & `Secondary Plasma Cutting Machine & Down-draft Table’ for a major UK heat exchanger manufacturer. To design, manufacture, deliver, install and commission the two enclosures, these being of approximate overall sizes 6.7m wide x 5.6m deep x 3.5m high & 11.0m wide x 4.0m deep x 3.5m high. The enclosures are to be fit for purpose in providing a safe working environment for operational and maintenance personnel. 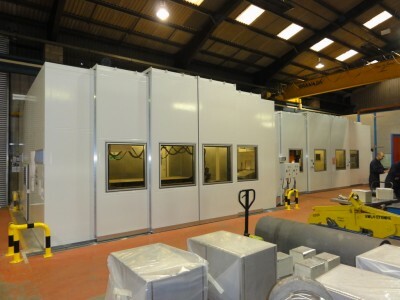 Each enclosure to provide the desired access in the form of bi-parting pneumatically operated, horizontally sliding doors and canopy, giving unhindered front and roof access to facilitate the loading and unloading of components and equipment via an overhead shop crane. Flush fitting siding door tracks to allow forklift trucks and other wheeled plant and equipment to freely enter the enclosed areas when the sliding doors are in their open position. The enclosures require personnel doors at the rear of the facilities for operator entry / emergency exit. Acoustically insulated vision panels that provide the necessary resistance to internal damage by flying debris and also protection from plasma arc glare (UV light) for anyone looking into the enclosed areas. Adequate ventilation of the enclosed equipment (whilst maintaining the acoustic integrity of the enclosures) to ensure that the temperature rise inside the enclosures is acceptable and allows the housed machinery to operate in a normal manner. The brief, which was fully met (and exceeded) was to reduce the existing Plasma Cutting Machine noise levels of 105 - 110dB(A) to below 80dB(A) outside of the enclosure (i.e. to below the First Exposure Action Level of the Control of Noise at Work Regulations 2005). I would like to thank you, the team and your site operatives for two custom built sound enclosures for our plasma cutting operation which are of high professional quality and standard. The design, functionality, front and roof access, acoustic performance and operation of the sound enclosures have been built to our specification and more. 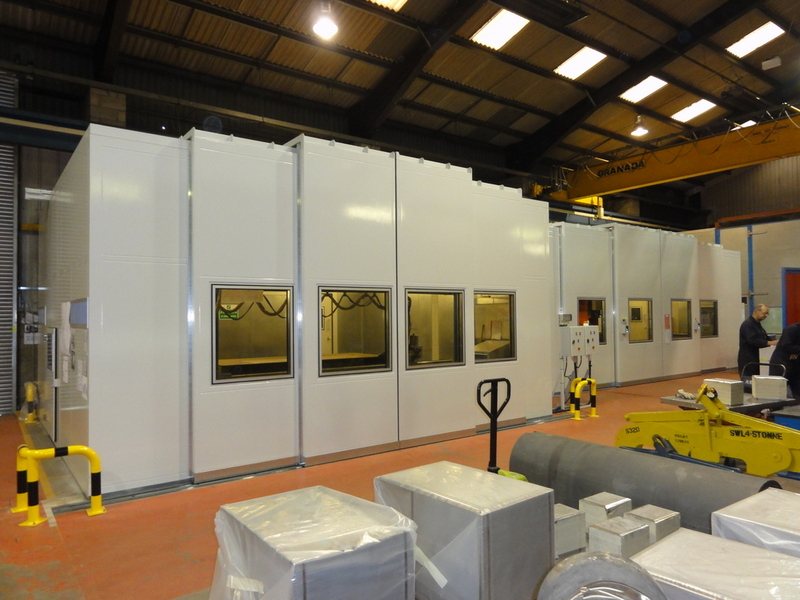 Furthermore, I want to thank you for your efforts in ensuring the enclosures met a tight installation deadline and were installed within the time-scale allocated, it was a pleasure working with Acoustic applications and all the best for the future."